Third time I cooked last week, the curry had a purpose. It was in aid of a much needed makeover. Before you suggest I’m in need of one, it’s for this blog. Some of you know that I started this blog to prove that if I, with my full on life, general inability to be organised and propensity for destruction in the kitchen, could cook Indian food then so could anybody else. Four years since, my campaign for curry is gathering pace. In the meantime, a brave new world of digital and social networking has blissfully passed me by. The man of the moment is my one and only blog guru and free audio kids stories supremo. I told him the site looked dull and dated. He reminded me that I had picked the colours and meddled with his ideas. 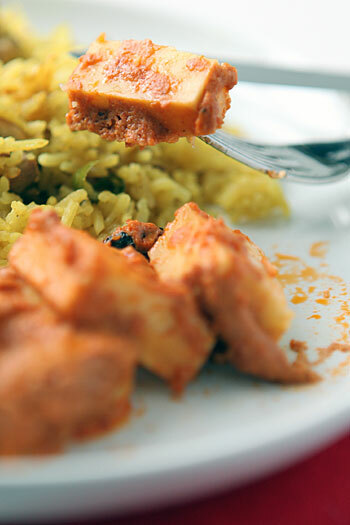 So this time we both decided over Kashmiri Paneer Masala, Chicken Pulao and red wine that we should ask you, the esteemed reader, what you think. What makes your blood boil every time you arrive here? What makes your heart soar? Pray, tell, what can I do to make it better for you? Finely chop the ginger. Puree the almonds with two tablespoons of the yoghurt and then mix into with the tomato puree and paprika. Cut the paneer into large pieces, like in the picture. Frankly, you can cut it up any way you want. It doesn’t matter. But it does look more special like this. In a large frying pan or medium kadai, bring the oil to heat on high. When it starts sizzling, add the bay leaf and cardamom. When they start spluttering, add the ginger. As the ginger turn golden, lower the flame to and stir in the yoghurt mixture. Leave this to simmer for about 2-3 minutes, until the masala takes on a rich orange hue and oil starts oozing to its surface. Just stir in the paneer at this stage for five minutes. When it softens, serve and eat straightaway. This was especially lovely the next day when the paneer had a chance to lie around in the masala. Well you *know* I’m a big, big, big fan of your site and the core of it is your absolutely cracking recipes (like this one). So don’t change a thing about that. And can you keep the Glossary, I use it all the time? Only suggestion I’d make is it’s sometimes hard to re-find a recipe. When I know you’ve made something that I’ve fancied and I’ve forgotten to bookmark it, I sometimes struggle to find it again. When I go through the recipe list it’s indexed by the name of the post and not the name of the recipe. Otherwise, just keep on posting m’dear. i luv ur space and everytime i comehere there is something fresh and yummy,.. I love the content of your blog! Like Kathryn, I agree that the recipe index could be improved by writing the name of the dish, rather than the post, which would make the browsing easier. I love this site and its clean and clear layout. Always looks very professional to me, and I’ve made several of your recipes and loved them all – thanks! I’m a recent fan of your blog and very much in love with it. Love the easy recipes and the professional look is great. Way to go! read latest needs to be update..
a little more personal maybe.. say lil cooking tips, your favourite comfort food, some food related trivia now and then. having said that, I really love your blog, as is. This looks so good Mallika! I love paneer! Tried this with naan last night and it was amazing! SO glad you are back to blogging! I find your site well presented with each recipe being categorised differently. Don’t be too bogged down with appearances: sure, aesthetically there are some improvements to be made, but who cares? some of the most useful sites on the web are terribly ugly, and some of the prettiest are terrible to work with. The only other thing I’d suggest is perhaps a bit of a glossary with ‘anglicized’ terms for things. I know whenever I introduce someone to Indian food (sadly, this is usually by restaurant menu), the first thing the are intimidated by is the names of things. “What the heck is a bhaji and will it give me heart burn?”, if I may quote my well-intentioned father from a few years back. Otherwise, the site is great. If you want aesthetics, I might suggest looking around at some CSS sites . Even if you’re not into programming, they can be inspiring in that regard. Cheers to you, and thanks for the recipes! Love this stuff I’m going to subscribe to yourlist. Would love to find out more about this subject. It’s great. Don’t change anything. Why try to fix something when it’s not broken? Mallika, I have been reading your blog from the archives, and I love it. Your style of writing lifts me up and makes me smile. Every recipe of yours I tried worked (my kids are enamored by your roti). I don’t know what I would change if I were in your place. If I had not read your blog “backwards”, I might have suggested, like some of the others, the recipe index by name. All in all, I love your blog. Just keep on! Hey its really nice dish and have to try this weekend surely.I have seen some of the kids and women competitions that are happening in chennai which was well updated by a parenting site.It shows weekly and many upcoming events in chennai. This is an interesting recipe,but just had one clarification. Would u pls clarify that? How much of Yoghurt are we supposed to use? Also…..”Leave this to simmer for about 20 minutes”..
Do we need to actually leave this for 20 minutes or is s it 2 minutes.. I had tried this recipe and found that within 2 to 3 minutes,the oil was beginning to ooze to its surface. You have a winner blog here, Mallika! 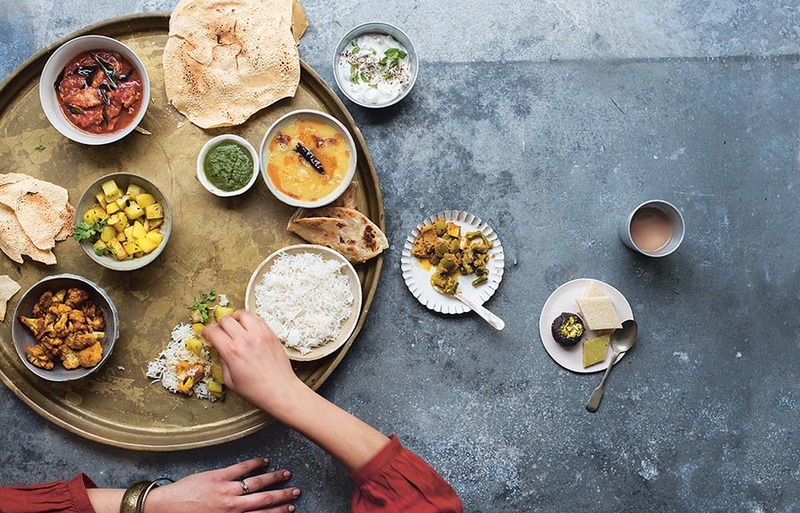 For someone who has been cooking Indian food (the hard way) for a while now, this is a refreshing outlook – especially when I will be starting my new job soon. Thank you and good luck. Recipe seems to be good i will have to cook once and write here again how was it , your book seems to be good . I tried this recipe and something seems to have gone wrong. The yoghurt turned from creamy to what appears to be granular and like someone else pointed out earlier, the oil seems to separate really quickly. So sorrt that the recipe is giving you trouble. Firstly, it’s v imp that you use full fat, thick yoghurt. This could be Greek Yoghurt or normal yoghurt hung in a muslin over a tap to give you “hung” curd. Anything watery will simply split. Also, it’s impirtant that the yoghurt is at room temperature. Cold dairy + hot masala will = grains! I think there is a typo in the recipe, which I have now amended. Please do try this again, it’s a yummy dish! 🙂 Love your post! and will try out this recipe tonight! Was introduced to your site very recently by my daughter. Just tried the Creamy Kashmiri Paneer recipe. A bit confused about the balance of the yogurt after 2 tbsps being mixed with the pureed almonds, chilly pwdr n tomato puree. When does it go into the pot?